If your perfect holiday involves making equine friends, then the Canterbury Plains will be paradise. Horse riding in Christchurch has many rolling valleys, lush meadows, and spectacular mountain backdrops that define this South Island jewel. 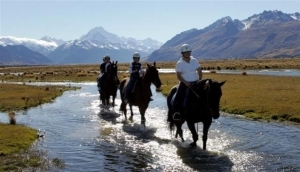 Christchurch Horse riding is one of the most relaxing pursuits you can enjoy while you're here. There are plenty of farms, riding schools and guided tours that cater for horse fans, and it doesn't matter if you've never even seen a saddle before. Cantering through glens, forest glades, lush, green meadows and colourful valleys, is exhilarating. Springfield, just 45 minutes from Christchurch, has a number of riding schools that run treks for all the family. If you're visiting Kaikoura, you can combine a marine wildlife excursion, with horse riding. Akaroa and surrounding peninsula, also has some excellent riding facilities, and some of the most awesome views in the South Island.